Going the distance :for over 25 years, the Nylofor 3d system has been the international fencing solution of choice for long distance and premium quality. The system consists of panels in various heights, square or Betafix Secure posts with specific fixing systems, adapted accessories and a wide assortment of innovative swing and sliding gates. All aesthetically pleasing and environmentally friendly. The Bekafix® Secure Post is a hollow “H” profile post with the dimensions of 70 x 44mm x 2mm. This post is made from a rolled sheet then hot dip galvanized and PVC coated to a minimum thickness of 200 microns using Betafence’s fluidized bed PVC coating machine. Nylofor 3M Panels are attached behind the front lip of the post using spider fixators and stainless steel security bolts which go through the post for added security. They are secured by shear of nuts to ensure that they are tamper proof. The Square Post is a 60 x 60 x 1.6mm post that has been hot dipped galvanized and then PVC coated using Betafence’s fluidized bed coating machine to apply a uniform lead free PVC coating. 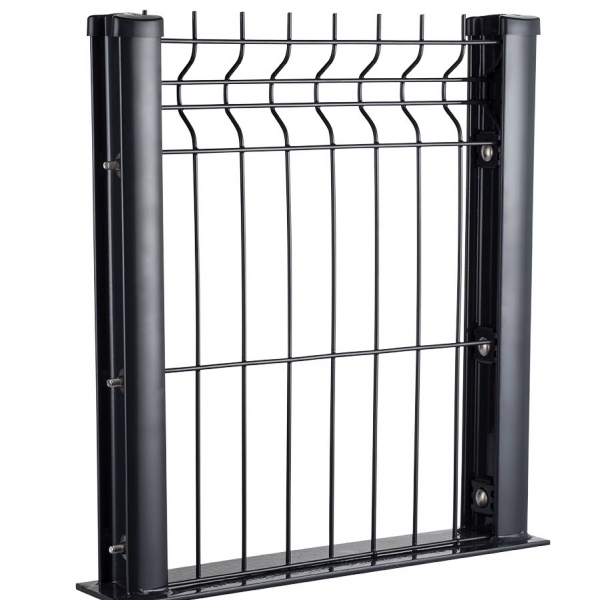 Nylofor 3M Panels are attached to the front face of the post using a spider fixator and security bolt.